Let us first see briefly about Vedanta, the philosophy of the Upanishads. Hindus, in spite of their differences in rituals, forms of worship and philosophical doctrines have a common factor i.e. their allegiance to Vedas, which is believed to be eternal and revealed by God to a few Rishis who could divine it through their refined mind. The Upanishads generally form the end portion of Vedas and contain the theological truths revealed by the Vedas. The philosophy expounded in the Upanishads is known as Vedanta and this term can be interpreted as 1) the end and goal of Vedas or 2) the essence of the Vedas and also as 3) the end portion of Vedas. Speaking of Upanishads, Swami Vivekananda says, “Bold, brave, beyond the conception of the present day, stand the giant minds of the sages of Upanishads, declaring the noblest truths that have ever been preached to humanity, without any compromise, without any fear.....Truly it has been said of the Upanishads by Ramanuja that they form the head, shoulders, the crest of the Vedas” (Lahore address,1897) ). (Hereafter volume no. and the page no. of collected works only will be given in brackets, when quoting Swami Vivekananda). The term Vedanta also denotes the major group of surviving schools of Hindu philosophy, Dvaita, Visishtadvaita and Advaita, although by usage this term denotes Advaita Vedanta only now. In expounding his philosophy of practical Vedanta, Swami Vivekananada, enunciated that these three are not contradictory systems though Dvaita, Visihtadvaita and Advaita differ in their interpretation of Upanishads in defining God, Universe and individual and their relationship to each other. He stated that in the three systems there is the gradual working up of human mind towards higher and higher ideals till everything is merged in the wonderful unity which is reached in the Advaita system, the unity of everything in and as Brahman and Brahman as and in everything. He pointed out that one system is based on another and there is gradual unfolding of the theme. It is like advancing from truth to greater truth to ultimate truth. “The old idea was to develop one at the expense of all the rest. The modern way is harmonious development. ---- He who gets the whole must have the parts too. Dualism is included in Advaitism” (7,87)” He attempted to make Advaita not the preserve of scholars and pundits but acceptable to material West, and understandable to common people of India without compromising its core principle. This view he expressed in his letter to Alasinga Perumal of Chennai, where he wrote” The dry abstract Advaita must become living-poetic- in everyday life: out of hopelessly intricate mythology must come concrete moral forms: and out of bewildering yogi-ism must come the most scientific and practical psychology – and all this must be put in a form so that a child may grasp it. That is my Life’s work”. (5,104). He could do it as he had the “head of Sankara and heart of Buddha”. Without devaluing the other two systems, he tried to re-state and re-interpret the Advaita Vedanta of Acharya Sankara with modern idioms, to meet modern challenges keeping in mind the great saying of Vedas “एकं सत् विप्रा बहुधा वदन्ति” – Ekam Sat Viprah Bahudah Vadhanthi(The Truth is one, wise men call it differently). Religion is the manifestation of divinity already exist­ing in man.(3.482). Superstition is a great enemy of man.(1.15). The conceptions of Vedanta must come out, must remain not only in the forest, not only in the cave, but they must come out to work at the bar and the bench, in the pulpit, and in the cottage of the poor man, with the fishermen that are catching fish, and with the students that are studying. … If the fisherman thinks that he is the Spirit, he will be a better fisherman; if the student thinks that he is the Spirit, he will be a better student. If the lawyer thinks that he is the Spirit, he will be a better lawyer, and so on. (3.245). When talking about Brahman as the only Reality, he emphasised also the oneness of all with Brahman. So the Universe being one with Brahman is also Real, as it is pervaded by Brahman. The Universe is only apparently real, when you see it as different from Brahman. For him Brahman is the noumenon, the unchangeable and Universe is the phenomenon, the changeable. Swami Vivekananda states that the Vedanta does not in reality denounce the world. What it seeks to teach is the deification of the world and not its annihilation - giving up the world as we ordinarily think of it, as it appears to us and to know what it really is. He stated that world is to be deified quoting the opening mantra of Isavasyopanishad which says "ईशा वास्यमिदगं सर्वं यत्किञ्च जगत्यां जगत् “ (Isavasyam idam sarvam yat kim ca jagatyam jagat) - All this, whatsoever moves on the earth, should be covered by the Lord." He amplified this idea when he stated: “The central ideal of Vedanta is oneness. There are no two in anything, no two lives. There is but one life, one world, one existence. Everything is that One, the difference is in degree and not in kind. It is the same life that pulsates through all beings, from Brahman to the amoeba, the difference is only in the degree of manifestation. We must not look down with contempt on others (2,299)”. And in emphasising all is Brahman, he also tried to emphasise the unity of personal God, Iswara and Impersonal God, Brahman calling the latter Absolute and the former relative. He felt all the views of Brahman being based on genuine spiritual experience of the Acharyas should be accepted as true of Brahman, the Ultimate Reality. The same harmonious approach he adopted in defining the paths to reach the goal of Realisation of one’s True Self. For him, each one of the yogas, karma yoga, bhakthi yoga, raja yoga and jnana yoga is capable of serving as direct means for the attainment of Moksha. In support he quotes Gita where Sri Krishna’s talks about karma, dhyana, Bhakthi and jnana and also talks of yoga buddhi in their performance to reach Him. Yoga buddhi is the intense desire seeking union with God. He also defined Maya not as illusion but as a triad of space, time and causation, which are only ideas or concepts in our mind and has no place in Brahman. 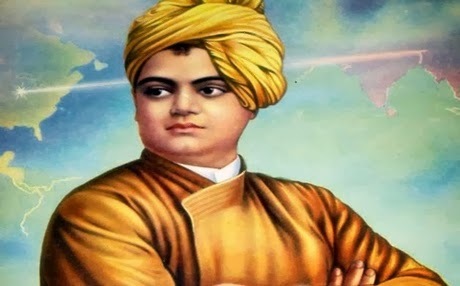 Swami Vivekananda himself gave a capsule summary of his practical Vedanta philosophy in one of his speeches as: “Each soul is potentially divine. The goal is to mani­fest this divinity within by controlling nature, external and internal. Do this either by work, or worship, or psychic control, or philosophy—by one, or more, or all of these and be free. This is the whole of religion. Doctrines or dogmas, or rituals, or books, or temples, or forms, are but secondary details.” (1.257). This incorporates the harmony and humanism he always emphasised along with the essence of Upanishads as revealed in the Mahavakhyas like “तत् त्वं असि Tat Tvam Asi” (you are that only) spelling out Jiva-Brahma-Ikyam. Differences in all living and non living things in the Universe lies in our perception, not in manifestation of Brahman, that is how I feel. All sentient and insentient things that make up the universe are manifestation of Brahman only. Great enunciation. Nice research.Hats off to your knowledge and wisdom.! May God bless you with hundred years of peacful, prosperous and happy life. Great enunciation testifying deep knowledge and wisdom.